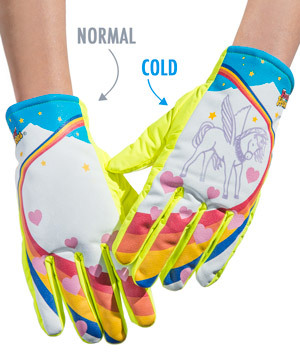 Freezy Freaky Winter Gloves: Throwback winter gloves that change colors. Slip your hands into Freezy Freakies and greet the cold with nostalgic glee. 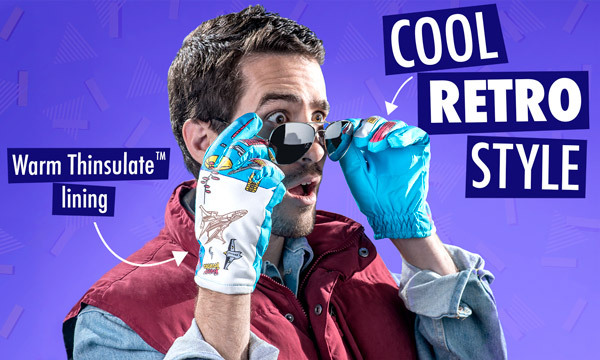 Each set of Thinsulate™ winter gloves features a multi-tone faux-leather outer shell decorated with a totally rad retro illustration. 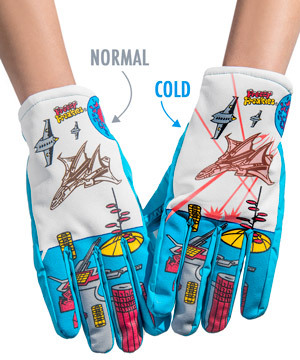 When the temperature drops low, the high-tech gloves' illustrations transform before your eyes as added color and detail appear! 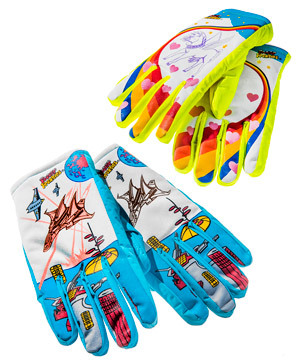 When it's cold outside, you'll look super boss and stay totally toasty with a pair of Freezy Freaky '80s-style winter gloves! Freezy Freakies might not be part of the Internet of Things, but they've got plenty of tech sewn in. These blasts from the past feature warming Thinsulate on the inside and a retro scene on each of the hand backs and fingers. When you don them in the cold, the illustrations transform, filling out with previously hidden details! Distract yourself from the cold with hidden designs. From hit streaming shows to screaming sax solos and synthesizers, the '80s are back. And now you can take your style for a ride in a time machine too. Featuring illustrations drawn before personal computers were a thing, Freezy Freaky Winter Gloves are totally boss. And thanks to polyamide outers, polyester lining, and Thinsulate inner lining, your hands will be as warm as your heart feels when watching Pretty in Pink. Staying warm never looked so cool. Freezy Freaky Winter Gloves are currently available in two sizes. 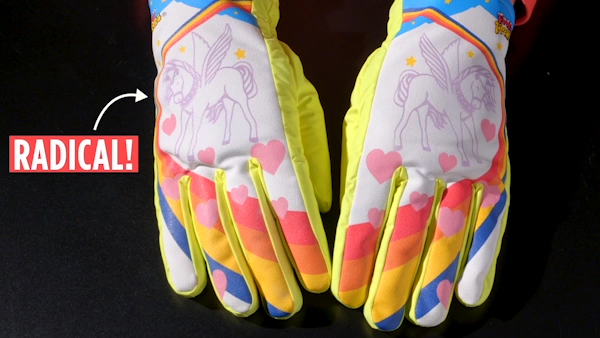 The Unicorn style, available in small, features a heart-strewn rainbow road that reveals a Pegasus-unicorn in the cold. The Fighter Jet style, available in large, features a futuristic dog fight over a visionary cityscape. When cold-activated, the jet changes colors, lights its afterburners, and shoots the most popular ammunition of the 80s, lasers. Question: Can I get certain styles in different sizes? 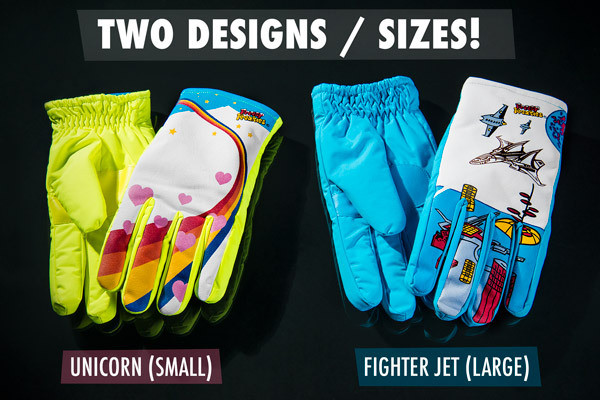 Answer: We currently only offer the Fighter Jet style in large and the Unicorn style in small. Question: What exactly transforms on these? Answer: When brought out into the cold, the unicorn style has a lavender winged unicorn appear. The fighter jet fills in with color, and laser beams and jet exhaust appear.